This fall Ideum began an ongoing collaboration with The Institute of American Indian Arts (IAIA). This fall Ideum began an ongoing collaboration with The Institute of American Indian Arts (IAIA). IAIA is a four-year tribal college in Santa Fe, NM that offers a wide array of studies such as Studio Arts, Museum Studies, Digital Art, Cinematic Art, Creative Writing, and Indigenous Liberal Studies. 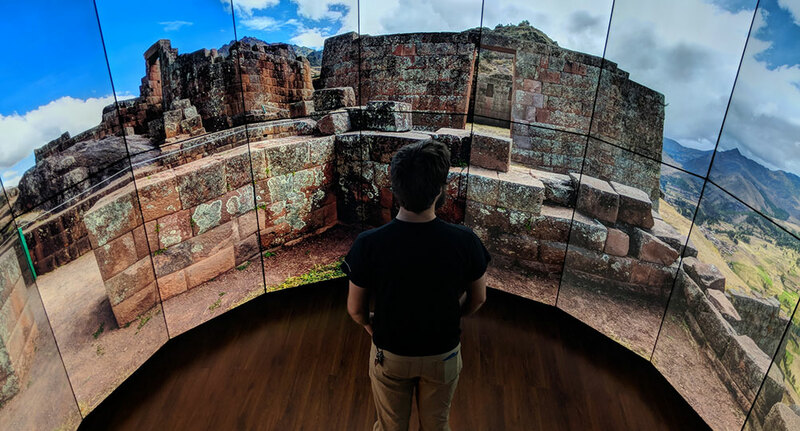 We look forward to working with IAIA students in exploring those paths and making new discoveries through a paid semester-long internship as an important team member. The first project of this collaboration is a large interactive touchscreen application to be installed at the Museum of Contemporary Native Arts (MOCNA) January 22-July 31, 2016 as part of The Influence & Art of Lloyd Kiva New exhibit. This project is the perfect marriage of tradition and technology. 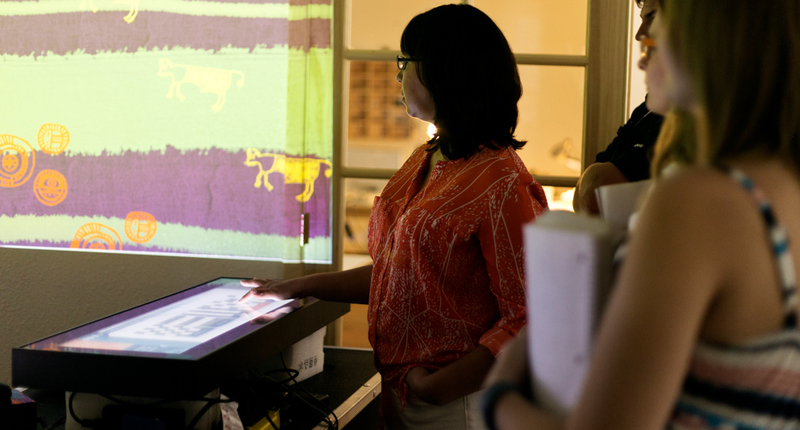 The interactive will feature two textile exhibit applications, a textile collection viewer and a textile creator, both designed and developed by Ideum in collaboration with experts from the Museum of Contemporary Native Art. The textile collection viewer features printed textiles created by IAIA students during the 1960’s and 1970’s under New’s artistic direction, drawn from the museum’s permanent collection and documented by IAIA’s Museum Studies students. The textile creator takes deconstructed elements of these textile designs and allows users to digitally experience the printmaking process via the touchscreen and a projection wall. Being able to use traditional indigenous imagery to inform contemporary indigenous art and exhibits while embracing innovative ways of communicating indigenous perspectives, culture, and design feels like a great fit for this collaboration, and we are excited to see how we can shape that future together. 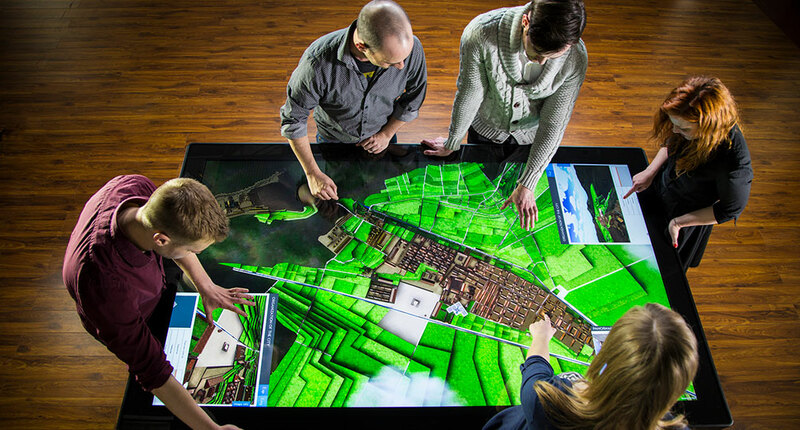 The multitouch part of the interactive application runs on an Ideum custom 38-inch “stretch” monitor. The textile collection images and the textiles created by museum visitors will be projected onto the gallery walls. 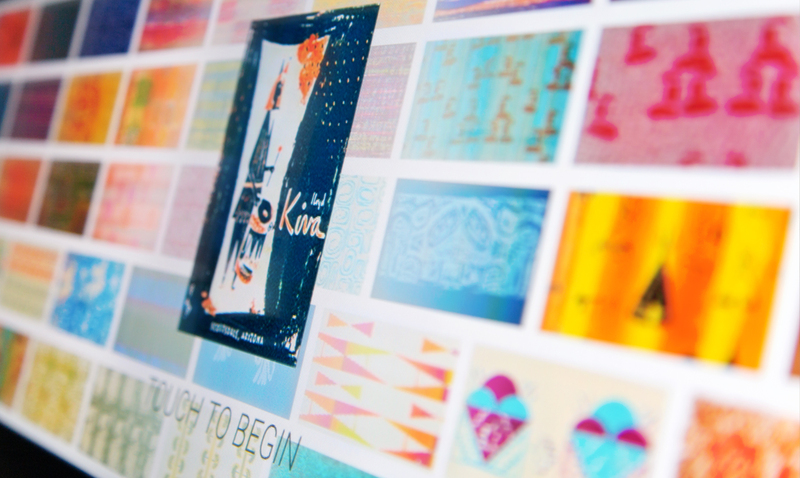 Visitors will have the option to share their creations to an IAIA Tumblr gallery. We will share more about this exciting project when it opens to the public in January! To learn more about Ideum custom hardware take a look at our blog post. Visit our website to learn more about our Creative Services projects.